I recently found a number of developers asking questions about Zip file handling in Apex, which as most find out pretty soon, does not exist. Statement governor concerns aside, nor is there any binary data types to make implementing support for it possible. Most understandably most want to stay on platform and not call out to some external service for this. And rightly so! A static resource is as the name suggests some that changes rarely in your code, typically used for .js, .css and images. Salesforce allows you to upload these type of files individually or within a zip file. Using its development UI and tools. Further more you can also do this in Apex. So in effect Salesforce does have a built in Zip handler, at least for unzipping files anyway. The snag is, uploading a zip file dynamically once your user has provided it to you. If you review the example code that calls the Metadata API from Apex you might have spotted an example of doing just this. To create a Static Resource you can do the following. They key parts are the assignment of the ‘contentType’ and ‘content’ members. The ‘content’ member is a Base64 encoded string. In the example above its a static peace of text, however this could easily be the zip file the user has just uploaded for you and then Base64 encoded using the Apex EncodingUtil. You also need to set the ‘contentType’ to ‘application/zip’. This example presents a user with the usual file upload, you will also need to ask or know what the path of the file is you want to extract. Of course if you know this or can infer it e.g. via file extension such as .docx or .xslx, which uses the Office Open XML format, then your good to go. I’ve shared the code for this here. Known Issues: If your zip file contains files with names that contain spaces or special characters, I have found issues with this approach. Since this also applies to URLFOR and generating links in VF pages, I plan to raise a support case to see if this is a bug or limitation. Also keep in mind the user will need to have the Author Apex permission enabled on their profile to call the Metadata API. Categories: Apex, Force.com | Tags: apex design, static resource, unzipping files, zip support | Permalink. Hi Andy – looks like a wondefully useful bit of code – I’ve imported it to test it out but I get “IO Exception: Unauthorized endpoint, please check Setup->Security->Remote site settings. endpoint = https://c.eu2.visual.force.com/services/Soap/m/25.0” I’m running as a system admin with Author Apex. If there anything else I need to set up? Hi Alex, thanks for the feedback. Even if you are running as Sys Admin with Author Apex, you still need to provide the URL to the Remote Site settings (Setup>Security>Remote Site Settings). Give it the full URL and it will take what it needs. It sounds odd but you do need to authorise your Apex code to call out to a Salesforce provided endpoint. If you do this, it should work just fine. Note that this approach has some limits on the path into the zip file your looking for. Take a look at Part 2 for something more flexible if you think you might hit this. Thanks Andy, that’s done the trick, as well as teaching me a bit more about end points! Running through part 2 now, which does indeed look more flexible – is the size limit set by JSZip or SalesForce? Excellent, your very welcome! Looking at what the JSLib author says about the size of files it can handle. I suspect Salesforce will limit the size before the JSZip library starts to have an impact. it is possible to convert excel file to csv file after uploaded…? Hi am new to salesforce. If i want to import this to my developer org how would i do it. Please suggest. – Point the wizard to the /apex-zip subfolder, it will prompt you for you DE org login details. – Once it returns to the Force.com IDE workspace, it should start in the background uploading the files (see bottom right corner), you will also see any errors in Eclipse Problems pane. BTW, would love to know more about your use case, if you can share something? Hi Andy, I have created a zip attachment with some text files in it. And i am trying to access the attachment from the VF page. Can you please suggest as to how should I go about?? Part 2 of this series deals with using some VF components I’ve developed to help with unzipping data, have you taken a look at this https://andyinthecloud.com/2012/12/09/handling-office-files-and-zip-files-in-apex-part-2/? The Static Resource approach only works for reading (some) zip files, but even then the draw back is the user needs to have admin permissions as that solution uses the Metadata API. The best all round solution for create and read, if you can tolerate needing to use the browser to do the processing is the one i describe in part 2 of this blog. 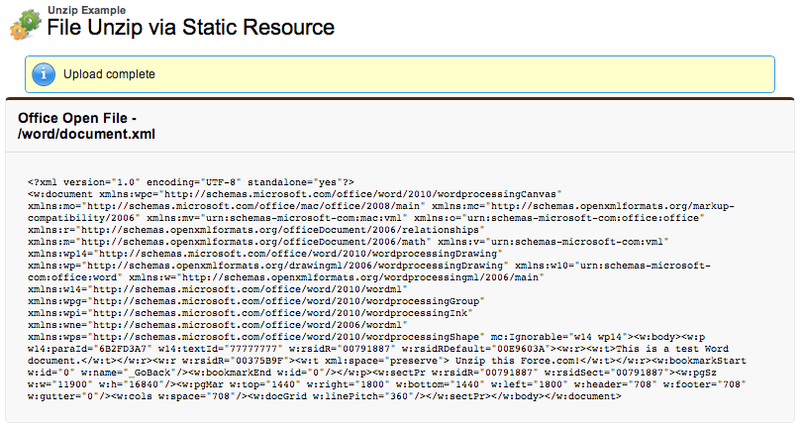 Maybe this is why ==> System.VisualforceException: Getting content from within triggers is currently not supported. So somefileRef.getContent(); will not work. LOL….this works. Well, I hope it helps somebody out there. I am trying to create a app where you select a zip file on visualforce and we save each file from zip as a attachment to a contact. The zip will mostly contain doc, docx and pdf files. 2) I am initiating JSZIP as below, is this correct? From visualforce, should I send the body as zipEntry.asBinary() or asText() or something else? In the remote method, what variable type should I use to accept the file body? I am getting error if I use Blob, and the file gets corrupted if I use String. Good news, what you want to do is pretty much the same as the demo code linked in this blog! Suggest you deploy to a test de org and experience it m.
What is the maximum file size for zipping and downloading files onto user’s local computer?